The Royal College of Surgeons of Edinburgh is undertaking a £1.5 million revamp of a former Edinburgh University Language school building. 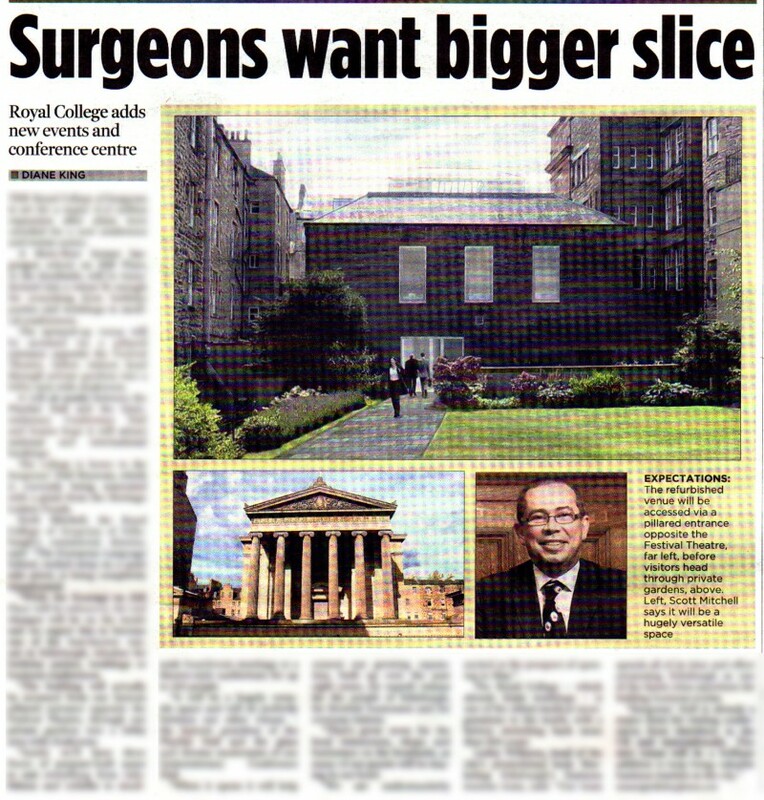 The Royal College of Surgeons of Edinburgh Commercial Enterprises specialises in making the most of the institution’s impressive buildings, with all the profits being invested back into running the globally-respected organisation, which delivers life-changing skills to every corner of the world. The ambitious plan to open its fourth conference and event venue at it South Side home grabbed coverage this week in local press and on various business network sites. The building is hoped to be transformed into three floors of event space, for hosting everything from birthday parties and weddings to medical conferences. Coverage was found in the Edinburgh Evening News. The local paper has a circulation of 24,299 and a readership of 91,678. The coverage included three images of the festival theatre, private gardens and the Royal College of Surgeons of Edinburgh’s commercial director, Scott Mitchell. The refurbishment was also picked up on various business news networks including; Aberdeen, Highlands, Lothian, Strathclyde and Tayside. Urban Realm online, Travel and Tour Europe, Daily Business Group and the National online also featured the story. All these platforms featured images of the project to go along with the story. To see the original press release on the latest project, click here. Vickie Henry is a part of the expert PR team at the award-winning Holyrood PR, public relations agency in Edinburgh, Scotland. The PR agency works with businesses across Scotland. As well as providing media relations, crisis communications, Holyrood PR also offers PR photography, affordable video for businesses, social media services and strategic content delivery for businesses.